Buy mussels with tightly closed shells or those that snap shut when tapped--otherwise they're not alive and fresh. Avoid those with broken shells, that feel heavy (meaning they're full of sand) or that feel light and loose when shaken (signalling that the mussel is dead). Shucked mussels should be plump, their liquid clear. 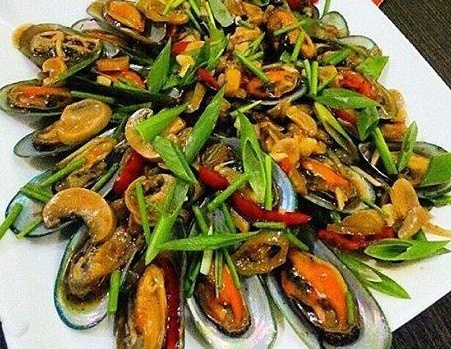 Small mussels will be more tender than large ones. 1. Place the mussels in a large shallow heat-proof bowl. Steam over briskly boiling water just until the shells open, for about five minutes. Remove immediately from the heat. Drain. Save the liquid in the bowl. Cool the mussels a bit then discard the empty half of the shells. 2.Heat the cooking oil in a wok or frying pan. Saute the onion for half a minute. Add the garlic and the ginger then continue sauteing for another half a minute. 3.Add the red bell pepper and the mushroom. Pour in the liquid from the mussels. Season with salt and pepper. Cook over high heat, uncovered, until most of the liquid has been soaked up by the mushrooms. 4.Add the mussels to the pan. Sprinkle with salt and pepper. Pour in the oyster sauce. Adjust the taste by adding drizzles of honey. Stir fry just until the mussels are heated through. Turn off the heat. Transfer to a platter. Garnish with chopped greens. Serve immediately.Enjoy!